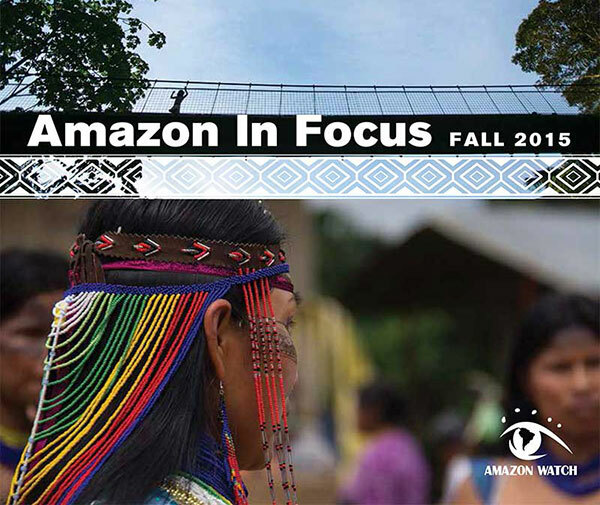 Cover of AMAZON in FOCUS 2015, the annual digest of environmental and humanitarian issues confronting the Amazon Basin and its peoples. Image: Amazon Watch. Aquarium enthusiasts know Amazonia as a motherlode of biodiversity, and most of us are aware that we have the great Amazon watershed to thank for a huge proportion of the fishes and plants that populate the world’s freshwater aquaria. 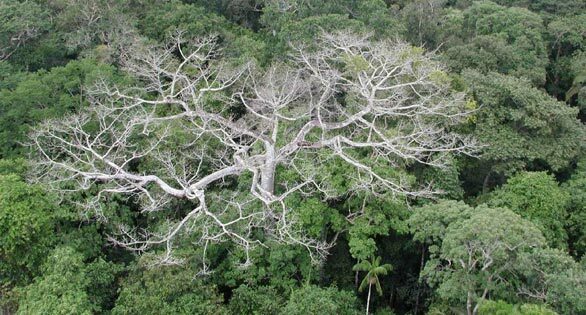 While public awareness of the importance of the massive South American rainforest is grown tremendously in recent generations, some observers believe that one of Earth’s greatest ecosystems is in danger of being lost to human development. According to informed observers, there are unprecedented forces at work that threaten the great Amazon Basin and its native peoples. • Continuing widespread deforestation to provide land for agriculture (often production of beef and soybean for export) and development. • Brazil’s aggressive national strategy of damming rivers in Amazonia to generate new supplies of hydroelectricity. Vast areas will be flooded, while others are allowed to drain and desiccate. Some are the ancestral homes of indigenous tribes as well as endemic plant and animal species, including many fishes found nowhere else. • China’s expressed interest in extracting natural resources from the rainforest, including oil. At the same time, petrochemical interests are exploring the possibility of bringing “fracking” technology to the Amazon. • Expanding populations and road systems that penetrate and despoil wilderness regions. • Global shifts in climate that are bringing changes that are still far from fully understood. 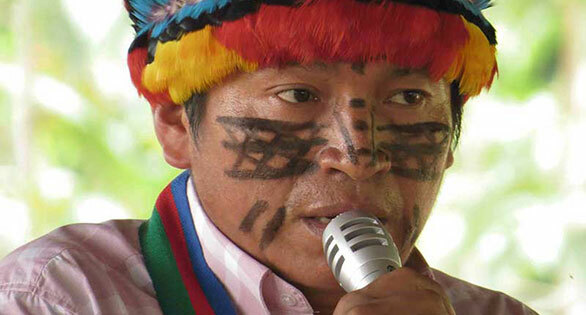 AMAZONAS Magazine readers who wish to stay informed about issues and events in the greater Amazon are invited to join with Amazon Watch, a leading defender of the Amazon rainforest and its peoples. Peas Peas Ayui of the Achuar people speaking against oil development in the Peruvian Amazon. Amazon Watch image. With global deforestation contributing 20–25 percent of all greenhouse gas emissions, Amazon Watch and our indigenous partners are providing a service to all humanity as we together seek to defend the rainforest. Each of us can take action. We may be the last generation that has a chance to protect this precious gem of our world’s cultural and ecological heritage – an irreplaceable source of life and inspiration. We envision a world that honors and values cultural and biological diversity and the critical contribution of tropical rainforests to our planet’s life support system. We believe that indigenous self-determination is paramount, and see that indigenous knowledge, cultures and traditional practices contribute greatly to sustainable and equitable stewardship of the Earth. We strive for a world in which governments, corporations and civil society respect the collective rights of indigenous peoples to free, prior and informed consent over any activity affecting their territories and resources. We commit, in the spirit of partnership and mutual respect, to support our indigenous allies in their efforts to protect life, land, and culture in accordance with their aspirations and needs.